Malaga is the largest tourist destination of the Costa del Sol, it is a city facing the Mediterranean Sea, a cosmopolitan city, open to anyone who wants to visit it and enjoy. If you decide to make your holiday in Malaga city, you will find a wide range of activities to do and a great cultural and historical heritage that will make your visit very enriching. In addition, as the capital of the province, the city is a great center of commerce where you can find everything you want, shopping centers, boutiques, decorations, and more stores. In a city with 3000 years of history, the range of things to see and do is so broad that it is really difficult to summarize it all in a few lines, but let’s start by taking a walk by its mythical Larios street which is a big shopping street, covered by awnings in summer to relieve from the heat. All along you will find stores of all brands and all types, so is the perfect forshopping. Plaza de la Constitución is the heart of the historic center of the city. Another place that you must visit is the Cathedral of Málaga, known as the Manquita, Calle Alcazabilla and the Alcazaba. Another must-see is Museo Casa Natal de Pablo Picasso and the Museo de Carmen Thyssen. There is a great gastronomic selection throughout the city of Málaga, but as a tourist, one of the most attractive places is the Paseo de Pedregalejo, which is full of bars, restaurants and beach bars where you can taste a delicious meal in a more "casual" way by the sea, and try the mythical "espetos" which are sardines that are crossed by a wood and cooked on the beach. Anchovies, fried foods, and all kinds of fish are the basis of Málaga cuisine, but remember: every dish must always be accompanied by a glass of sweet wine of Málaga, some of their standards of international fame. Of course, Málaga is perfect for eating tapas, as a good Andalusian and Spanish city. Another attraction is the typical local cuisine, which can be enjoyed in all kinds of restaurants, or on the terraces of the bars where tapas are served with a typical wine of Malaga. The Malagueños are fun people and spend a lot of time outside, as the good weather permits, so the streets are always lively and are a great attraction for tourists visiting the Costa del Sol. And of course, its 16 sandy beaches equipped with services are great for a holiday of sun and sand. Holidays in Malaga will be a sure hit. Málaga always offers a broad agenda of children's activities, and there are places where children can enjoy and learn such as la Noria, el Museo de la Música, el Jardín botánico and several theme parks nearby that can be the perfect choice for a day of fun with kids. Moving away from the center, you must go to the Paseo del Muelle y el Palmeral de las Sorpresas, a perfect place to walk, enjoy the sea breeze and the beauty of the place. If you love nature and tranquility, the Botanical Garden is an oasis within the city. At dusk, if you want a nice place and atmosphere to stroll and have dinner, nothing beats the Paseo de Pedregalejo. Málaga is a tourist destination well connected by road, there is a large network of roads and highways linking the city with the Costa del Sol and the rest of the peninsula. There is also the southernmost international airport in Continental Europe, from the airport there are several options to reach the city by bus, train or taxi, as it is only 8km from the city. Another good option is to get to Málaga by train, as the city has a line of high-speed trains: AVE. Commuter trains are available also if you come from other nearby towns. There is a wide range of apartments and villas in Malaga. 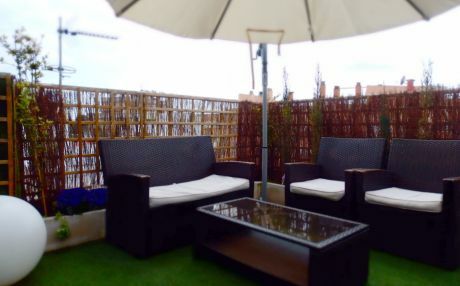 There are different areas to stay in Malaga, you can choose the area of ​​the Old Town, a very Andalusian area between historic buildings, a lively and bustling area of ​​narrow streets, which is a very picturesque neighborhood. Another option would be to stay in the coastal area, near all its beaches. Malaga has 3 beaches awarded with the Blue Flag, which certifies the quality of its water, cleanliness of the beaches and the good range of services. The area of ​​Playa Malagueta is one of the most sought after by those who choose to stay in villas or apartments for rent in Malaga as it is full of restaurants, cafes, shops, and lots of awesome atmosphere. 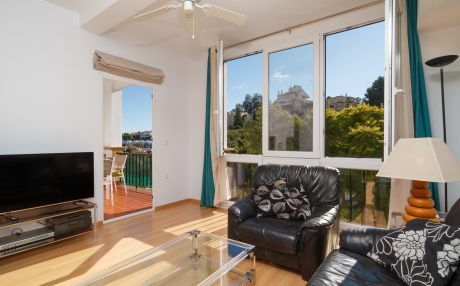 From the entire range of accommodation of the city, nothing better than renting an apartment in Malaga, which is the best way to enjoy freedom in a convenient and cheaper way and in a good accommodation in the place you choose. This way you can also live it up like a local, which allows you to know the city and its people better.